Eagles' Menzie Yere in action against Rochdale. Eagles recently cemented a dual-registration agreement with London Broncos, which saw three players drafted in for their last outing against Toronto Wolfpack. Aston has also signed Warrington prop Pat Moran on loan, whilst veteran centre Menzie Yere has also agreed a deal until the end of the season after completing his UK citizenship. Whilst Yere has headed out on loan to Doncaster for some much-needed game time, the other additions have seen some of Aston’s youngsters temporarily pushed down the pecking order. 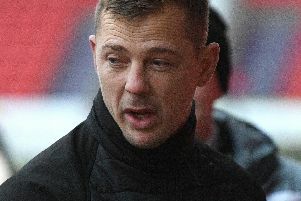 But Aston confirmed that the long-term mission with the likes of Paddy Burns, Blake Broadbent, Rory Dixon and Lewis Taylor remains the same – he is committed to developing young players. At this moment in time, Aston feels his side need some short-term help, but the young guns will keep getting opportunities, according to the long-serving coach. “We are still committed to developing our own players, of that there is no doubt,” Aston said. “We have lads here like Blake Broadbent and Paddy Burns, players we had in our academy, who have a future here if they keep progressing like they have. Prop Taylor, who has played just once since joining the Eagles, has had relatively little experience in the game. A graduate from Loughborough University, the rugby union convert enjoyed a spell at Hemel last season. The youngster has taken the opportunity to go out on loan to League One side Coventry on an initial one-month loan deal. Aston said: “Lewis has progressed well so far during his time here but he still requires some growth and this move facilitates that. Yere made his debut for Doncaster at the weekend, scoring a try in their Challenge Cup victory over Batley.